You might think the recounting of 40 years at the Oxford English DIctionary to be a pedantic slog. Balderdash! Former Chief Editor John Simpson humorously dives deep into choice words to elucidate how the English lexicon has morphed and adopted words over centuries and how the O.E.D. has tried to corral this constantly shifting sea of language. You'll never read the dictionary the same again. Can you drink a glass of balderdash? And what do you call the part of a dog's back it can't scratch? The answers to these questions can be found in the Oxford English Dictionary. There is no better guide to the dictionary's many wonderments than its former chief editor, John Simpson. In The Word Detective, an intensely personal memoir and a joyful celebration of English, he weaves a story of how words come into being, how culture shapes language, and how technology transforms words. 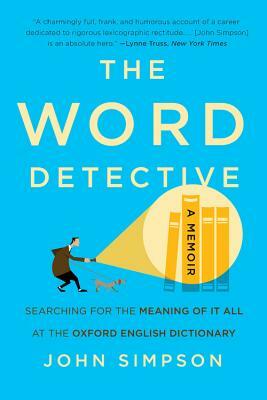 A brilliant and deeply humane expedition through the world of words, The Word Detective will delight and inspire any lover of language. "A former chief editor of the dictionary, Simpson reflects on nearly four decades as a gatekeeper of the English language. Along the way, he offers insight into how words come into being and a look at origins of a scattering of words: inkling, deadline, apprenticeship, balderdash."